Often when we travel we don't have time to do everything we want. But there's one stop on your visit to Spokane where it's easy to multitask. Visit the Northwest Museum of Arts and Culture on Tuesday's during April and drop-in on a Pilates class at the same time! Each of the afternoon exercise sessions will teach participants proper form and function a variety of Pilates’ movements. Led by Polestar-Certified Pilates instructor Larkin Barnett, the comprehensive fitness series will establish a strong foundation of the core Pilates principles while slowly molding a flexible yoga body. The design of Pilates is to build core strength without building muscle bulk. And by combining Pilates with yoga, you'll tone and tighten while improving balance and flexibility. Organizers ask participants to bring an exercise mat and water bottle. The hour-long class begins at 1:30 and costs 13.50 for non-members or 15 dollars for members. If it's local flavor you're after, why not sit down to a performance by locals. It's one of the oldest traditions going in Spokane and considering it was incorporated back in 1947, the Civic Theatre is one of the oldest community theaters, not just across the state, but across the country. While its stylish exterior refurbished in the late '60s fits right into the alpine landscape, actors and actresses deliver standout performances. This month, from March 22nd to April 14th, catch Broadway hit and Tony award-winning production, The Curious Incident of the Dog in the Night-time. Or check out their Spring schedule here. And if the night leaves you feeling inspired to get on stage yourself, Spokane Civic Theatre's Academy Program might be just the ticket! From age 5 to 95, any theatrical enthusiast is welcome. Instructors teach more than script rehearsal with lessons on accountability, discipline, team-building, and positive reinforcement. Cheer for the Spokane Chiefs! Want to feel the grace of ice rink aerobics without doing any of the work? Then buy you and yours a ticket to watch the Spokane Chiefs crush the pocket on a power play as they fight to take the U.S. division title. The Spokane Veterans Memorial Arena hosts the Chiefs half a dozen times this month. And the red, white, and blue athletes will give you something to cheer about even on the grayest winter days. Want to bring the kids? Boomer the Bear will make their experience a cute and cuddly one. 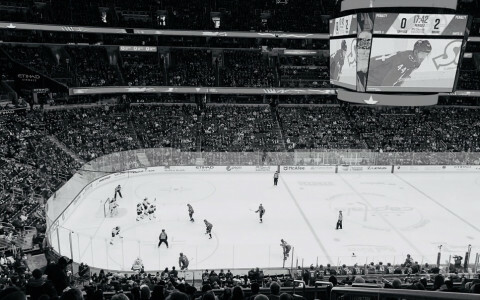 Plus, auctions, theme nights, slap-shot competitions and "suite-stakes" are all possibilities for fun between periods of play. Learn a little bit about the team before you go or dive into the Chief's fandom when you arrive. Buy the gear, grab something to eat, and take your seat. Or stand and cheer for your new favorite team! We've told you about Spokane's spotlight brews, but now is the time to gather the troops and carve your path through the Inland Northwest Ale Trail to find them! A treasure hunt for craft connoisseurs, this path has its own map. Find the maps at most regional hotels, participating breweries, or Spokane’s Visitor Center kiosk. There are more than 36 highlighted breweries so you might consider planning your crawl in advance. And we did say crawl; it's not a race... but there is a prize! If you bring your map along to each brewery, one drink will earn a stamp from that brewery. Ask for a stamp in the taproom or from someone on the staff. Turn in a map with 12 stamps and win a 32 oz grunt. Filling it is up to you, however, so return to your favorite brewery and top it off with your favorite. From November to February, family and friends can enjoy Spokane's premier ice skating experience, the Ice Ribbon. This winter wonderland consists of 16' wide and 650' long pathway with a 3,500 square foot attached pond. All the ups and downs of the path are lined with a breathtaking view of the Northwest-inspired landscape. All around the ice ribbon are cozy fire pits for spectators to sit and sip cocoa, and enjoy watching the skaters zip through the ribbon. 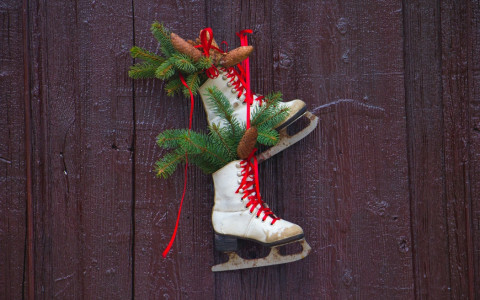 Enjoy a list of programs and activities at the Ice Ribbon like free ice skating lessons, "cheapskate" nights, themed dress-up events, happy hours, and more. This year's Ice Ribbon features an ice sculpture. In line with this year’s theme of “Fire and Ice,” the sculpture, depicting bricks and flames, will have actual flames inside of it. The Ice Ribbon is open daily, closed only on Thanksgiving and Christmas day. Fall in Spokane is breathtaking. The trees are shades of bright reds, oranges, and yellow and the air is crisp. There’s nothing like having a beer and enjoying the wonderful weather. And if you like to see the source of Spokane’s local beers, take a Spokane beer tour. A few local favorites are the Perry Street Brewing Company, No-Li Brewhouse, and River City Brewing. Perry Street Brewing comes in heavy and hearty, having won gold at the Great American Beer Festival in 2016. If you’re looking to savor your beer here, try pairing it with some of Perry Street Brewings delicious and healthy sandwiches and snacks. The No-Li Brewhouse is no joke. This internationally-recognized brewery knows good beer. Plan to hang out at the patio and enjoy a few of the menu options while you are at it. The brewery takes hints of Spokane and transfers all of that rich flavor and landscape directly into your pint. River City Brewing is a riot. “Drink local” is all they ask of Spokane visitors. And with River City’s array of flavors beers, it’s hard to not to. This bustling pub and brewery will be sure to quench your thirst and keep you happy. 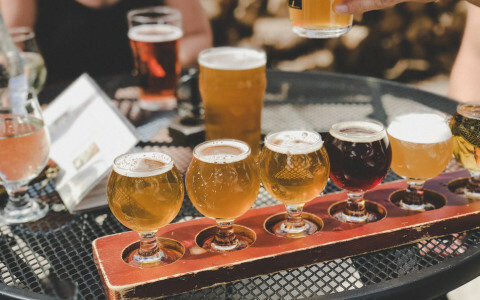 If you are a real beer enthusiast and looking to catch all of the breweries in the area, check out the Inland Northwest Ale Trail. They'll make sure you don’t miss a single stop. Since 1931, the Martin Woldson Theater at The Fox has been a Mecca for films, performers, and their appreciative audiences. Recently renovated, the 1600-seat theater is one of the City’s vintage jewels, appropriately set in the heart of Spokane’s thriving and dynamic performing arts milieu. The Theater’s stunning décor and acoustics provide the perfect home for the Spokane Symphony, as well as an array of stellar entertainers and touring companies from around the world. This month, the Theater presents outstanding symphonic offerings, including Cirque de la Symphonie on October 13, and the Spokane String Quartet with selections from Haydn, Bartok, and Dvorak on October 14. On October 15, the season opener of the Gonzaga Symphony Orchestra will feature renowned solo violinist Shlomo Mintz for the performance of Tchaikovsky’s Symphony No. 4 in F Minor, Op. 36, and Mendelssohn’s Violin Concerto in E Minor, Op. 64. October 20-21 brings Spokane Symphony Classics: The Heroic, and the Spokane Symphony Special: Haunted Hallows will showcase the bewitching music from Harry Potter October 27 and 28. Attendees are encouraged to come in costume for pre-concert festivities. One of the most beautiful outdoor recreation and leisure areas in all of Spokane, Manito Park and Botanical Gardens is located less than 15 minutes by car from the Best Western Plus Peppertree Airport Inn. The name of the park derives from the Algonquin word manitou, which refers to a fundamental life force animating all things, and with 90 acres of immaculately tended terrain, encompassing an arboretum, conservatory, and botanical gardens, Manito Park is just what you need to refresh and revivify yourself this fall. Join the more than 150,000 visitors who come every year to take advantage of the various walking and biking paths, multiple playgrounds, enchanting flowers, and topiary shrubs. Among the several elaborate gardens, our favorites are probably the Duncan Garden, with its stately granite fountain and symmetrical design, and the Nishinomiya Tsutakawa Japanese Garden, an oasis of tranquility and a testament to the kinship of Spokane and its sister city, Nishinomiya. What vacation would be complete without at least one fine dining experience? Though there are many great options in the city, our favorite is probably Anthony’s at Spokane Falls, less than 10 minutes by car from our hotel. Open for lunch and dinner throughout the week, Anthony’s serves the freshest, most delicious seafood and produce you’ll find anywhere in the Pacific Northwest. Your visit is a treat not only for the palate but also for the eyes, as the main dining room features a glass wall with breathtaking views of the Spokane River and upper falls. This outstanding location on the edge of the downtown area makes Anthony’s the perfect spot for either a romantic dinner or a casual lunch while you’re out exploring the city. As an added bonus, valet parking is available daily after 4 P.M., meaning your Anthony’s experience will be full service from start to finish. If you’re an art lover who enjoys whimsical designs and would like to explore more of the Spokane arts scene, consider stopping by the New Moon Art Gallery. Just a quick 10-minute drive from our hotel, New Moon showcases the work of dozens of talented artists and artisans from across the Inland Northwest. Among the many handcrafted pieces in the shop, you’ll find paintings, prints, sculptures, cards, woodwork, pottery, jewelry, and many other eclectic treasures. The gallery regularly hosts special exhibitions, as well as a variety of workshops for all skill levels, from the total beginner to the advanced student. Currently, New Moon is exhibiting the work of husband-and-wife duo Chuck and Alice Harmon. Chuck specializes in majestic landscape painting while Alice likes to experiment with playful designs and bright splashes of color to delight the eyes. Whether you’re looking for that perfect piece to add to your collection, or you just want to browse, New Moon Art Gallery is a great afternoon destination for art lovers in Spokane. Come down to the park starting at noon to enjoy live, local bands, craft vendors, tasty eats, and the sudsiest of beer gardens. At nightfall, you’ll be perfectly positioned to watch the fireworks burst above Spokane River Gorge. Located in the Kendall Yards neighborhood, Olmsted Brothers Green Park is a great place to picnic on Independence Day as you groove to the musical stylings of Crow and the Canyon. When the stars come out, sit down along Centennial Trail and enjoy the fireworks display illuminating the downtown sky. It doesn’t get much more American than baseball. Grab a beer and a hotdog, and get ready to cheer on the Spokane Indians. When the game is through, sit tight. It’s fireworks time. On Sunday, May 6, tens of thousands of folks from around the world poured in Spokane for the 42nd annual Bloomsday Race. Seeing so many come out to compete and raise money for charity was truly inspirational. If you missed the race, fret not. You can still have a rip-roaring good time with Row Adventure Center, the premier organization for outdoor adventures in Spokane, Cour d’Alene, and environs. The company, which has been owned and operated by the same couple for over three decades, is able and eager to arrange the perfect outing for you, your family, and friends. Whether you’re into canoeing or kayaking, tubing or whitewater rafting, a leisurely boat tour or a round of extreme water sports, Row Adventure has exactly what you’re looking for. After a fun-filled day out on the water, you’ll be glad to head back to the pristine comfort of your room at Best Western Plus. Spring has returned to the Pacific Northwest, and with it, the urge to get outside and soak up that warm, exhilarating sun. Some 50,000 folks will do just that on Sunday, May 6, as they lace up their running shoes and hit the pavement for the 42nd annual Bloomsday Race. As the most massive timed road race anywhere in North America, Bloomsday attracts runners from all corners of the country who are ready to cover the 12-kilometer route in the name of charity. Bloomsday prides itself on its spirit of inclusion, too, welcoming not just runners, but walkers, wheelchair users, assisted wheelchair users, and folks with strollers. Sign up to compete for cash prizes, or just join in for the sheer joy of the race. Visitors can also enjoy the Bloomsday Trade Show, featuring hundreds of vendors dealing in health, fitness, and recreational goods and services. The Trade Show will take place Friday, May 4, and Saturday, May 5, at the Spokane Convention Center, located at West 334 Spokane Falls Blvd. The story says that St. Patrick rid Ireland of snakes. How nice for Ireland. Still, it’s tough to not want to celebrate such a miraculous feat and wonderful culture. If you’re looking to enjoy debauchery and mischief like a leprechaun might, the city of Spokane has you covered with several events to get your St. Patrick’s day on. Start with the Annual St. Patrick’s Day parade which begins at noon and ends around 3 p.m. You can check out the parade route here. After seeing the fun, consider joining the Irish Drinking Team for a pub crawl. The Irish Drinking Team events do have events starting as early as 7 a.m. for those diehard St. Patrick’s Day fans. To find information about a day filled with fun click here. It’s definitely the luck of the Irish that such a fun holiday should fall on a Saturday this year, so get out there and enjoy yourself. If you’re looking for a fun and romantic way to spend your time in Spokane, Riverfront Park has got you covered. Aside from its convenient location, a quick 5-minute walk from the Best Western Spokane, Riverfront Park offers an array of romantic and family-friendly activities. Check out the newly opened Skate Ribbon. The Skate Ribbon is 16 feet wide and 650 feet long and boasts a 3,500 square foot pond. In addition to the Skate Ribbon, enjoy some time near one of the many glowing fire pits situated along the Skate Ribbon, perfect for watching skaters and indulging in a cup of hot cocoa. The Skate Ribbon is only one of many winter activities to be enjoyed at Riverfront Park. On February 14, enjoy a lesson with a skating instructor, lights, and music. Thursday nights are themed nights and Friday nights at the Sky Ribbon Cafe offer happy hour specials. Stay a while on Friday nights to enjoy dancing and a DJ. For the schedule of winter activities and tickets click here. The new year is here and you’re ready to make it your year. Well, why not roll the dice, and check out the Northern Quest Resort and Casino for a fun and exciting day out. Start your day relaxing at La Rive. The spa offers a host of services ranging from massages, wraps, as well as manicures and pedicures. Work your way to the slots and table games and win big! There is a wide range of options in this Vegas-style Casino. Play blackjack, craps, or roulette. Heck! It’s your night out, play all three. Don’t forget to try the slot machines too. When you need a break from the games, head to one of the three nightclubs: Impulse, The Lounge at Maslow's, and Liquid. You can lounge, relax, and play. After a full day of fun, check out one of the many onsite restaurant options. In addition, you can catch world-class entertainers at the casino. For information and to make plans click here. It’s that time of year when the holiday spirit is everywhere. The lights are shining, the mistletoe is hung, and there is no better way to keep that festive spirit glowing than by spending an evening enjoying one of the many holiday-themed showed being put on by Spokane Civic Theatre. You’re in town and you’re in luck. Through the holiday season, the Spokane Civic Theatre has three productions that you’ll want to check out. Will Ralphie get his all-important BB gun? Why not find out and make a night of it with the family and enjoy A Christmas Story on the stage. This show runs until December 17. You might also want to check out Academy: Santa Claus Conquers the Martians. This show promises to be fun for the family and runs through December 10. Lastly, for a more adult-friendly show (sorry, kids you’ll have to stay home for this one), check out Holiday Hijinks. This show pokes fun at the holidays and makes a great date night activity. The theatre is located only 6 miles from the Best Western Peppertree Spokane. For tickets and showtimes, click here. Who doesn’t want to have their cake and eat it too? Well, now you can at Riverfront Park. Just a 5-minute walk from Best Western Plus Peppertree Spokane, you’ll be face to face with one of the best urban falls in the country. Since the Riverfront Park is located in downtown Spokane, you’ll not only have access to all the park has to offer – biking and walking paths, the 1909 Looff Carrousel and Gift Shop among other activities – you’ll also be close to restaurants and shops, all within walking distance from the park. Riverfront Park affords the opportunity for both young and not-so-young to enjoy the day and the views. Click here for more information on the park and enjoy a beautiful day outdoors in our lovely neighborhood. Classic Rock artist Janis Joplin exploded onto the music scene in 1967 and became the queen of Rock & Roll. October 15th, 2017 at 6:30pm is your chance to witness the sounds from Rock & Roll royalty at the INB Performing Arts Center. Spokane is invited to share an evening with the woman and her musical influences in the hit musical A Night with Janis Joplin. The unparalleled voice of Joplin is filled with raw emotion with a hint of the south. A Night with Janis Joplin is guaranteed to be the highlight of your trip to Spokane, WA. Fueled by such unforgettable songs as Me and Bobby McGee, Piece of My Heart, Mercedes Benz, Cry Baby and Summertime, this life-altering show is a musical journey celebrating Joplin and her biggest musical influences. Tickets are between $27-$77, but the memory of witnessing the music from a legend is priceless. A special premiere party event is headed your way in Spokane, WA. The SYFY’s network’s television series, The Z Nation, is premiering season 4 at the Northwest Museum of Arts and Culture. Season 4, episode 1 was shot all over the Northwest Museum of Arts and Culture and features several Spokane area talents from actors to onset crew. So you can imagine the hometown love and excitement that will be in the room on Friday, September 29th at 8pm. Catch the premiere and chat it up with the cast and crew of The Z Nation. Wether you’re in search of networking opportunities or in search of a cool way to end your trip to Spokane this special premiere event at is just for you. Feel like a celebrity at the special premiere of The Z Nation at The Museum of Arts and Culture. Visit northwestmuseum.org for tickets and additional information. Are you ready to kill two birds with one stone? A little sightseeing coupled with a nice seafood dinner sound good? If so, Anthony’s at Spokane Falls has got you covered with sights and eats. Visit downtown Spokane to dine at Anthony’s for top quality Northwestern seafood and produce. Anthony’s fresh cuisine needs no help convincing guests to visit – however, the waterfall background is an added bonus! The restaurant overlooks the Spokane River and upper falls. The cascading river gushing over Spokane Falls takes your breath away and compliments Anthony’s dining experience. The restaurant is open for lunch and dinner and valet parking is available after 4pm for restaurant guests. A visit to Anthony’s is sure to leave you gushing about Spokane, Washington. Visiting Spokane, Washington for a family trip with the little ones? Take a day to enjoy Coeur d’Alene Park just 4.4 miles from The Best Western Plus Peppertree Spokane. Spokane is home to 17 splash pads that provide summer fun for kids throughout the city. And let’s face it, hopping and splashing in water is the best way to cool off during the summer months Coeur d’Alene Park Splash Pad is open May 27th through September 10th for the 2017 summer season. Spend the whole day taking in the park and splashing in water with the little ones at Coeur d’Alene Park’s splash pad open from 9am to 8pm. Enjoy the Coeur d’Alene Park with the entire family and leave drenching wet.